Man, I am always happy when a good comic comes out about a teen superhero. And this is a really good comic. So the Amazons have finished attacking, and there are a lot of dangerous mythical beasts strewn about the greater D.C. area since the Amazons were all zapped away. 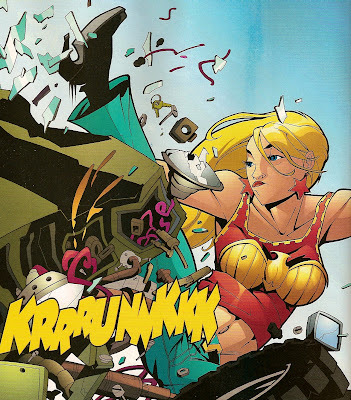 Someone has to clean them up, and that someone is Wonder Girl! 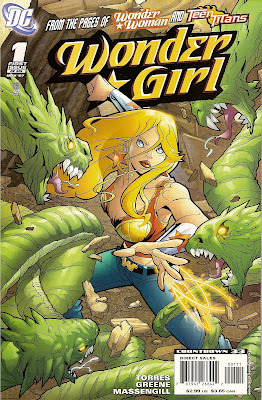 So here's what I liked about this comic: it gives a very brief and enjoyable overview of the character for new readers; it is very funny and entertaining to read; it has great artwork by Sanford Green; it's all-ages appropriate; it ties in to larger DC events without being confusing to people who haven't read the other comics; it gives us a little bit of the aftermath of Robin and Wonder Girl's near-kiss from Teen Titans #50; Wonder Girl is an awesome character who is feeling very sad and alone but is dealing with it by going out and helping the very people that hate her. She's a tough girl. It's rad. And she totally goes Street Fighter Bonus Level on a military jeep! And speaking of perfect, I really could not possibly love this comic more than I do. Is anyone else just grinning like an idiot while reading each and every page? It's just so much fun! 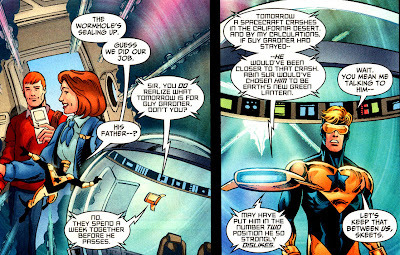 - Booster's ultimatum: bring Ted back or I quit. Seriously. This comic is so fantastic. The word 'terrible' gets thrown around a lot these days, but I think it can accurately describe the contents of the current arc on this series. And the one before this one. But especially this one. 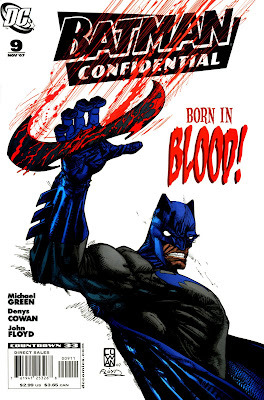 This series has almost replaced All-Star Batman and Robin as my favourite terrible comic. I love reading it because it's so jaw-droppingly bad. Now, I don't like to be really negative on this blog. I'm not out to hurt anyone's feelings or whatever, but this comic is just really, really bad. In ways I can't even wrap my mind around. 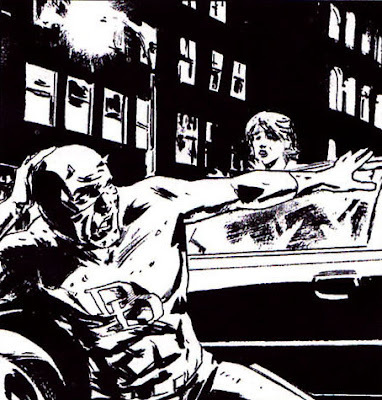 At least with ASB&R it's just Frank Miller being a jerk and writing a purposely bad comic for his own amusement. With this series it's more depressing because what we have is a television writer who had an idea for a Batman story and no one had the heart to explain to him that it's stupid. At least that's what I assume. I'm not completely against playing with the origin of iconic characters, but I am against making those origin stories much, much worse. It's very stupid to write a story where the Joker gets his deformed mouth when Batman throws two batarangs at his face. It's stupider to write a story in which Batman orders a hit on the Joker. It's stupider still when the Joker is not even the Joker yet. He's just some crazy guy who robs and kills people with no gimmick. And Batman knows his name, meaning he's gonna know who the Joker is. Add to this some very clunky writing that implies the author only has the most tenuous grasp of the characters involved, and that perhaps the research ended with a viewing of Tim Burton's Batman movie ten years ago. What you have is a bad comic. With a glossy cover. 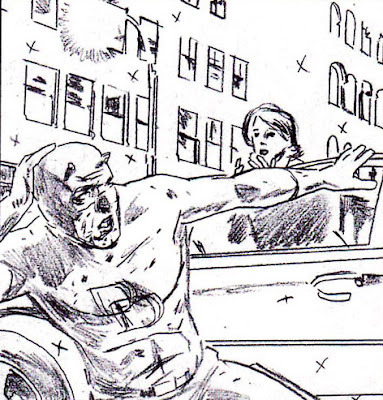 On the plus side, it gives me hope that perhaps I could one day write a Batman comic. 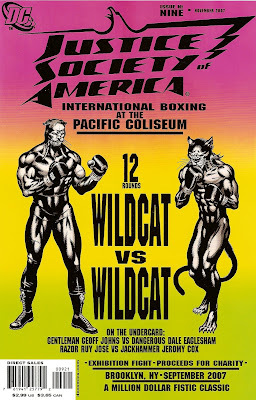 Now let's get back to awesome comics. I really liked this. 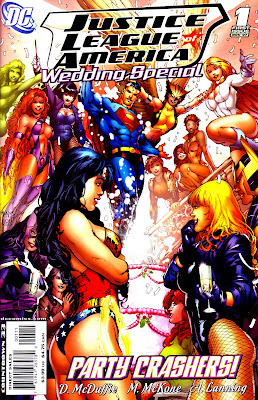 Perhaps because it had very little to do with weddings and more to do with DWAYNE McDUFFIE WRITING JLA! WOOT! 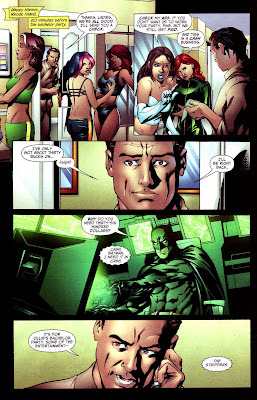 I love Batman and Hal. 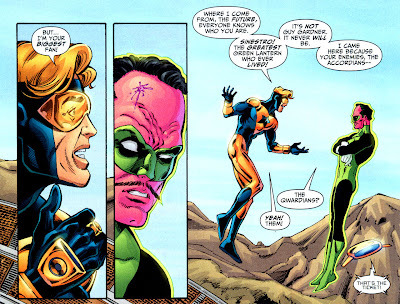 Hal's the cool guy who hates having to ask for help, especially from annoying nerdy weirdos. And Batman is an annoying nerdy weirdo who talks all cryptic instead of just giving a straight answer because it annoys the hell out of the cool guy. You know what else I loved? Bachelorette party at a gay bar. And, y'know, everything else. What Aquaman is that? The same one I'm reading about in Aquaman right now? 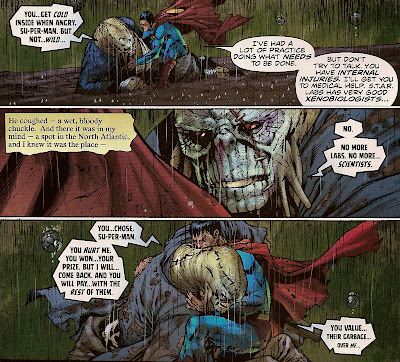 The ending of the last issue of JLA confused me so much. Is this still "new"? Can we start calling it The Avengers soon? Please? All that I have to say about this is that I liked the little scene where Dr Strange did that spell that revealed everyone's true selves. Especially Hawkeye (or Ronin, or whatever). 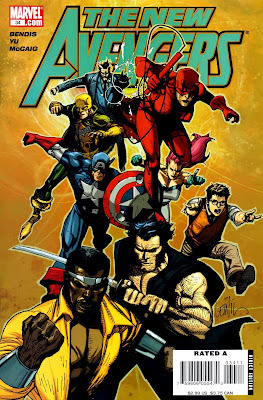 Y'know, I've read pretty much this entire Avengers series and I conclude that these guys don't really do much. 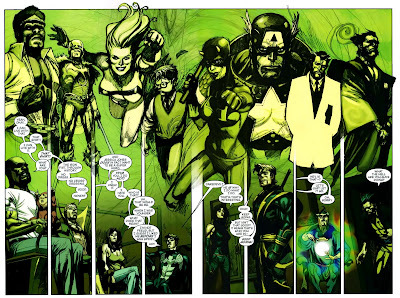 We've had, what, three or four issues now where they just lounge around and talk about who's a Skrull? Aren't there Hulks to stop? And aunts to save? (Actually, I'm very glad they aren't dealing with the Aunt May thing in Avengers). Oh! Wolverine got his junk ripped off in this issue. That was neat. Seriously. I was interested in this series. I was at least curious. 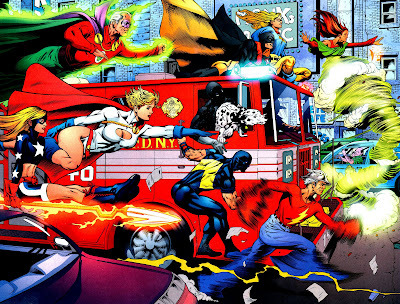 There's nothing terrible about the idea of crossing over DC and Wildstorm per se. It's at least interesting. But when it's as rushed as this was (and by that I mean the story was rushed along due to space restraints. I don't know how long it took to write this), it's just a jumbled mess with no purpose. 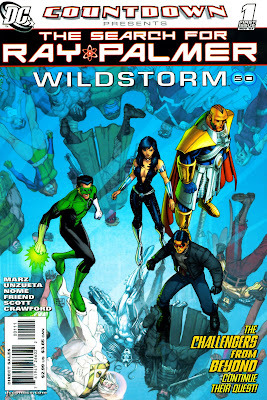 This did not introduce the Wildstorm characters in any way that would make someone want to explore them more. 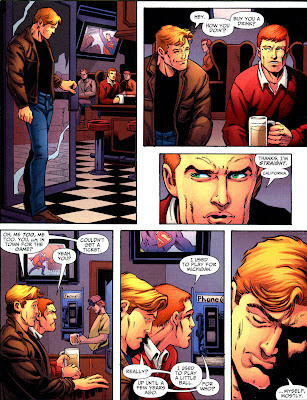 Pages were wasted on an undeveloped and uninteresting love triangle between Kyle, Jason and Donna (Donna being the apex, sadly. If everyone was fighting over Kyle, I'd be a lot more on board). Anyway, where was I? Oh yes. Pointless. And weird. And really just awkward. I think I'll give the rest of these a miss. I think they are basically just ads for Elseworld re-prints anyway. Like, do I need to read a story about Donna Troy, Jason Todd, Kyle Rayner and some Monitor wandering around Gotham By Gaslight? No, I don't. I'm jumping off this crazy train before they get to planet Thrillkiller. Or Planet In Darkest Knight. And this would be what we call a good tie-in. I was surprised by how much I liked the first issue of this series, and I liked this one even more. It's decidedly not appropriate for all ages, and that's nice from time to time. 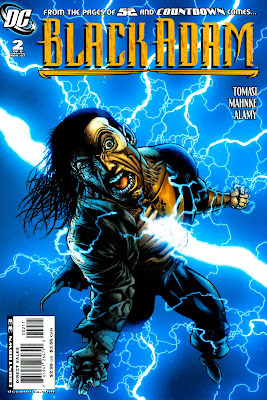 I also really like Black Adam in a Red Sox hat. I'm glad he keeps it for a couple more pages. I also really liked seeing Ralph Dibny again, even if it was just his rotting corpse. It's just good that someone is talking about him. Where the hell is that guy's funeral? This is just a really good comic. It's compelling, and it looks great. The 52 tie-ins are kicking the Countdown tie-ins all over the place. One of the best comics out there gets a nice anniversary treatment this month. 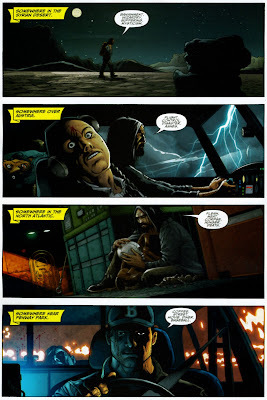 The story has been really exciting lately, what with Milla accidentally murdering a man, and Daredevil facing Mr Fear. 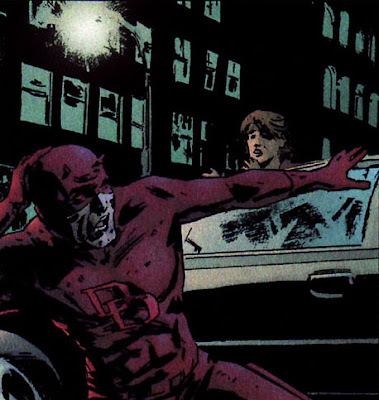 This comic was as good as all Brubaker Daredevil comics, with the added bonus of having some guest artists contribute short sequences throughout. Lee Bermejo, John Romita Sr, Bill Sienkiewicz, Alex Maleev, Marko Djurdjevic and Gene Colan join Michael Lark and Stefano Gaudiano to make a really excellent-looking comic book. 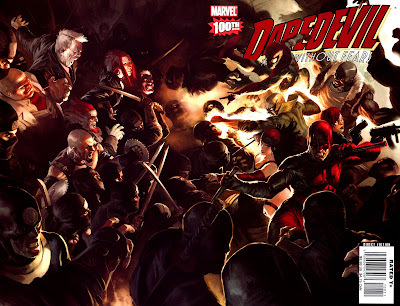 It's a nice thick comic, but that's mostly due to a re-print of Daredevil #90 in its entirety. I was more excited about the page evolution stuff at the back, showing script, pencil, and ink pages from the different artists. They didn't show the evolution of the Turner variant cover, which is good because it kinda looks like he just barfed it out. (Man, I am really mean today). And Camelot Falls is almost done. I feel like I've been reading this storyline for about two years. How long has it actually been? I'm gonna miss Pacheco's art on this series. First of all, awesome cover. Secondly, I really loved the whole fire department-fundraiser pancake breakfast thing that the JSA was participating in. 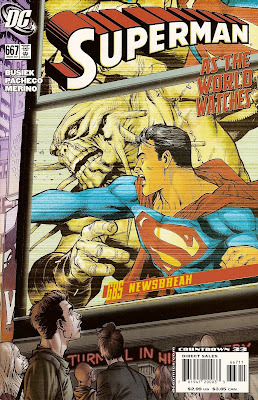 Now we get to see Kingdom Come Superman join the team for a couple of issues. I'm interested in seeing how this goes. 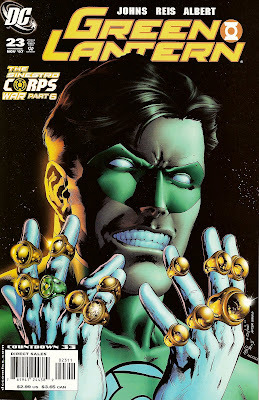 I read three comics by Geoff Johns this week and they were all excellent. Just sayin'. Props. 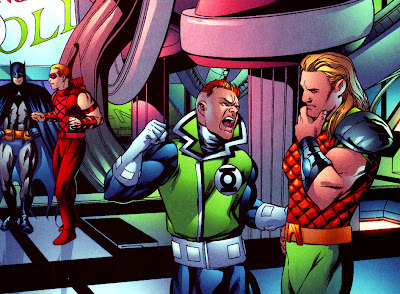 Also, in two of those comics (this one and Booster Gold) we had Guy Gardner mentioning his abusive alcoholic father. Kinda interesting. And sad. Poor Guy. 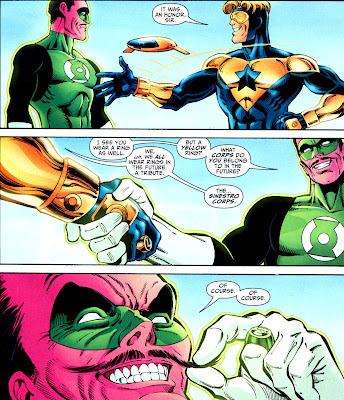 I love Sinestro Corps. It's just so exciting. 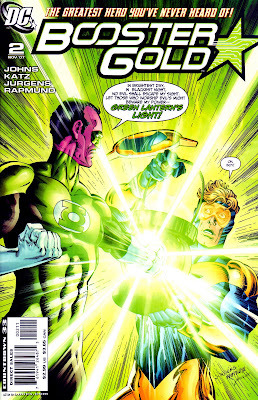 Now the lanterns have been given the ability to use lethal force! Crazy! And the battle is coming to Earth! Alright, back to the accounting and statistics. Ehn. Maybe it will help me keep track of the multiverse.